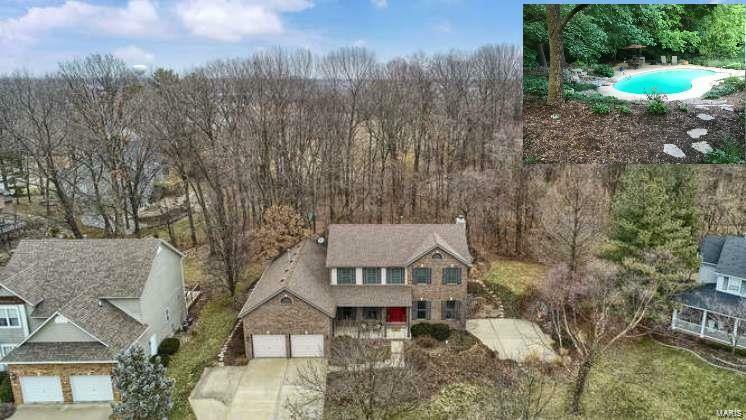 Wonderful Wooded Walkout Home featuring PRIVACY, In Ground Dugger POOL, natural stone WATERFALL, 4 Bedrooms, 4 Baths, Large Screened Porch, finished Lower Level with 4th full bath,a nonconforming 5th bedroom, Family Room and Wet Bar. In addition, entertain on large deck or side 30X30 concrete Patio (has Basketball Hoop too). Home is situated on a picturesque knoll with approximately 2/3 wooded acres and backs to Airplane Park. This lovely landscaped GEM shows many updates: freshly painted, newer Kitchen, Roof, Windows, Light Fixtures, Flooring and more! Located in Homes of Center Grove ~ minutes from shopping, SIUE, schools, bike trails, restaurants, YMCAs, and expressways. Call for your appointment today!